Gov. Walker says vouchers have helped the public schools improve. 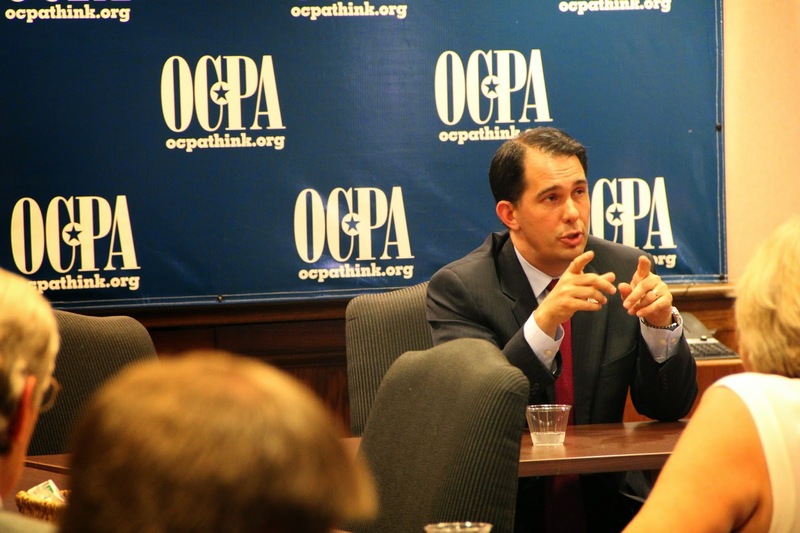 In a visit to OCPA on May 29, Wisconsin Gov. Scott Walker offered a passionate defense of Wisconsin’s statewide school voucher program. It’s not a matter of public schools versus private schools, Walker said. (His own children went to public schools.) Rather, it’s a matter of ensuring that every family has the opportunity to choose the best school for their son or daughter. Oklahomans want those opportunities. In December 2013 the Friedman Foundation for Educational Choice commissioned a statewide survey of Oklahoma voters. The survey was conducted by Braun Research, Inc., a company which has been used by such research firms as Gallup and the Pew Research Center. Right now more than 9 in 10 Oklahoma students attend a traditional public school. But the survey found that Oklahomans want more choices. The results are especially pronounced among those voters who are paying the closest attention: parents of school-aged children. One in three parents say they would choose a traditional public school for their children. The rest would choose a private school, a charter school, or homeschooling. Doubtless aware of this underwhelming demand for its product, the government school monopoly fights hard every legislative session to make sure none of the little revenue units head for the exits. In 2014 the results were mixed. The monopoly folks were able to squash a charter school expansion bill, a parent trigger bill, and a bill which would have provided Education Savings Accounts to allow low-income kids in Oklahoma’s worst-performing schools (basically the bottom 10 percent) to go to a private school. They were less successful on other fronts. The state's scholarship program for Special Education students — which is already saving lives (go to YouTube and type in “Lindsey Nicole Henry Scholarship Stories”) — was expanded to include students who have been provided services under an Individual Family Service Plan through the SoonerStart program (see photo below). Gov. 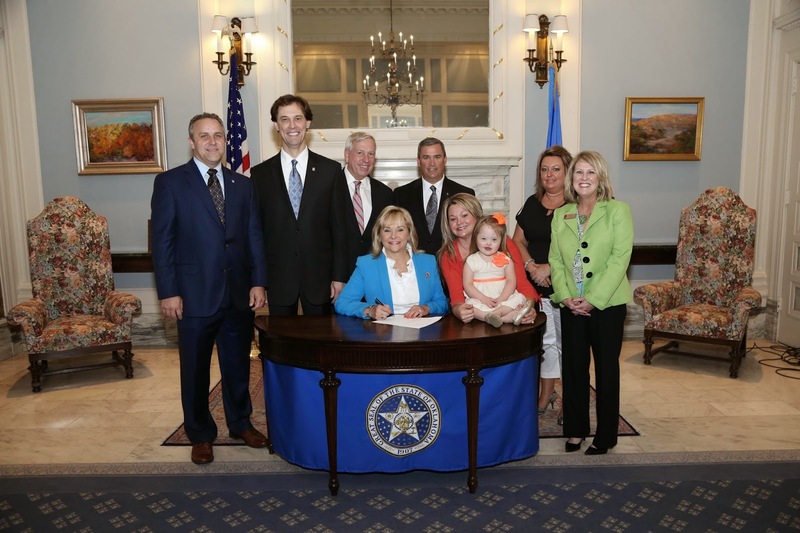 Mary Fallin inked legislation to expand the Henry Scholarship program. In addition, Oklahoma’s popular tax-credit scholarship program (63 percent of Oklahoma voters favor it, 28 percent oppose) was expanded. Under the program, Oklahomans can donate to philanthropic organizations which help families pay private-school tuition. The newest such organization, the Opportunity Scholarship Fund, was launched this year. Board members include OCPA president Michael Carnuccio and state Sen. Jabar Shumate (D-Tulsa). With these scholarships, kids get an opportunity to go to a school where the third-grade illiteracy rate is — here’s a concept — zero. And donors get a 50 percent tax credit. A new law increases the tax credit to 75 percent. Let’s empower Oklahoma parents with the choices they want and deserve.